Kindly shared here with permission from the author. The Bonnie Doon or Mill Creek streetcar line served a distant and lightly populated area east of the centre of Strathcona. The line was certainly a development line meaning that its purpose was to attract potential residents to settle in the area it bisected. Its construction was one of the conditions written into the Edmonton-Strathcona Amalgamation Agreement. Although the City boundaries were wider, most of the early development in Strathcona took place in a small area bounded by 99 Street on the east, 106 Street on the west, the North Saskatchewan River on the north and 76 Avenue on the south. The City of Strathcona like many communities of the day dreamed of expanding borders. Strathona made sure that these expansion plans were written into the amalgamation agreement wherein it became part of the City of Edmonton. Strathcona invested $38,000 to build a bridge over Mill Creek to attract business from the surrounding area to Strathcona and to assist in the development of the area immediately east of Mill Creek. The bridge opened in 1911 . The bridge was 150 metres long and was 21.3 metres above the water level in Mill Creek . A.C. Rutherford, the ﬁrst Premier of Alberta, had invested in real estate in the Whyte Avenue - Mill Creek area. Rutherford donated land in the Mill Creek Ravine just north of the bridge for park purposes. His holdings were signiﬁcant enough that the ﬁrst school in the area completed in 1911 and located near the intersection of 88 Avenue and 91 Street at the end of the streecar line was named Rutherford School. Rutherford School is still operating as part of the Edmonton Public School system. The Edmonton Bulletin of September 9, 1912 reported that the committee of the newly organized South Side Improvement Association met with the Commissioners. The committee were assured positively that the street railway would be continued across Mill Creek this fall if weather permits. The street railway tracks will be laid on the west side of Rutherford past the Catholic College. I have to point out here that establishing the position of the track on 91 Street is a challenge. I have not found a deﬁnitive source conﬁrming whether the track was ﬁnally located on the east side or the west side of the street. In preparing Edmontonʼs Electric Transit in the late ʻ70s and early ʻ80s the general consensus of people most likely in the know is that the track was located along the east side of the road. That includes people retired from Edmonton Transit who worked for the Street Railway Department during the 1930s (Wilf Robertsonʼs name comes to mind) as well as well known local streetcar followers such as Norm Corness, Bob Walker, John Meikle and Eric Smith. Regarding the condition of Rutherford Street the Commissioners promised to put it into better condition just as rapidly as weather conditions would permit. On November 21, 1912 the Edmonton Bulletin reported: Completion of the street railway across Mill Creek and up past St. Johnʼs College, the Rutherford School and to the very door of Carman Methodist Church will be a great boon to the residents of Mill Creek. It will be put in operation on December 1. Eventually this car line will be linked up to make a loop line around across Clover Bar Road and down the hill across east end bridge to connect with Jasper Avenue. For the present it will be a dead end line. The loop line never was built. ​The Bonnie Doon streetcar line did open for service on December 1, 1912. The original route operated from Whyte Avenue and Fourth Street West (108 Street) east along Whyte Avenue to 91 Street where the car turned north to run to 88 Avenue at Rutherford School. Actually 91 Street was named Rutherford Street before the street numbering system was introduced. 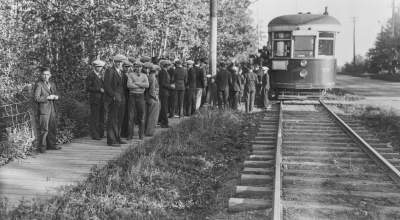 This early stub route created problems for passengers transferring to an Edmonton-bound car at 99 Street and Whyte Avenue as they were obliged to surrender their transfer to the conductor upon boarding that car. If they wished to transfer to another route upon reaching Jasper Avenue they were required to pay an additional fare. A couple of weeks after the Bonnie Doon service was inaugurated a personnel issue arose and got considerable press coverage. The Bonnie Doon car assignment was out of the South Side car barn which was located at 110 Street and 83 Avenue. One Saturday morning the motorman took the car out and noted that it had a broken fender. After making a few runs, the motorman returned the car to the barns and demanded that the fender be repaired. Words ensued over the telephone with the Superintendent at the main car barn in Cromdale. The Superintendent ﬁred the motorman on the spot for refusing to obey the order to return the car to service. That action raised the ire of both workers and management. The motorman noted that children play along the tracks on the Bonnie Doon line and that safety was a factor. The motorman also noted that the Mill Creek Bridge was a challenging crossing and the car should be in ﬁrst class operating condition. After negotiations the motorman was reinstated and changes were made to the stafﬁng and equipment at the South Side car barn to permit a faster response to car and track repairs. With the introduction of the Bonnie Doon service more cars had to be housed at the south side car barn. This situation called for the expansion of that facility . A front page Edmonton Bulletin story of Wednesday September 24, 1913 reports that one of the High Level Bridge cars had just turned on the wye at 99 Street and Whyte Avenue when it started to roll east down the grade on Whyte Avenue as the motorman had left the car unattended. It struck a standing Bonnie Doon car 37 at the end of the paved portion of the road on Whyte Avenue thought to be at about 96 Street. The Bonnie Doon half-hourly stub line service apparently remained in effect until November 13, 1913 when twenty minute service was introduced by cars running on route 4 the Red and White line via the High Level Bridge into downtown Edmonton. The Red and White line provided ten minute service as far along Whyte Avenue as 99 Street. Every alternate car proceded through to Bonnie Doon . Following major track and route expansions and equipment purchases in 1913 the Edmonton Radial Railway was forced to seriously curtail services due to the outbreak of World War I and the resulting economic downturn. Property sales and city expansion abruptly halted. The boosterism of the day burst. The Edmonton Radial Railway announced that effective February 8, 1914 the Bonnie Doon route would be tied into the McKernan Lake route providing hourly service over the route. This was called the Red and Blue Route. Bonnie Doon residents did not at all like that their three times hourly direct to downtown car service was to become a once hourly service once again necessitating a transfer on the south side. They expressed their displeasure in no uncertain terms to the management of the Edmonton Radial Railway. The railway countered by challenging the residents to increase their use of the cars to make the three times hourly service viable. So the Bonnie Doon residents did just that and the Edmonton Radial Railway true to their word reinstated the direct to downtown twenty minute Red and White sign service. During the summer of 1915 however the Red and White sign service was altered to provide a car every 15 minutes in rush periods and every 30 minutes mid-day. The street railway was under constant pressure to alter service in order to reduce steep ﬁnancial deﬁcits. That route and service level remained in effect on the Bonnie Doon line until October 17, 1917 . The Bonnie Doon line was linked to the Highlands line and operated as the White line maintaining a twenty-minute level of service. That route and level of service was maintained until May 1940 when the last streetcar departed from the Bonnie Doon wye. Repairs to the Mill Creek bridge deck did not include refurbishing of the streetcar rails and so on June 9, 1940 the streetcar service was replaced by a diesel bus running a shuttle between 88 Avenue and 91 Street to 99 Street and Whyte Avenue . The Bonnie Doon streetcar line likely carried a number of passengers during the summer who would go out to view the Silver Heights Peony Gardens. Silver Heights was located a short walk north and east of the end of the streetcar line at 92 Avenue and 87 Street. Tony Cashman writes of these gardens in a story titled George Branderʼs Silver Heights Peony Gardens in his book The Best Edmonton Stories published by Hurtig of Edmonton in 1976. The peony garden at Fort Edmonton Park on 1920 Street just west of the railway crossing commemorates the Silver Heights Peony Gardens. Monto, Tom, Strathcona Before the Great Depression, pp. 310, 315. --, Naming Edmonton From Ada to Zoie, p.221. Hatcher, Colin K. and Tom Schwarzkopf, Edmontonʼs Electric Transit, p. 49. Hatcher and Schwarzkopf, op.cit., p. 67. Hatcher and Schwarzkopf op.cit., p. 84. Hatcher and Schwarzkopf op. cit., p. 109. Cashman, Tony, The Best Edmonton Stories, Hurtig Publishers, Edmonton, AB, 1976. Hatcher, Colin K. and Tom Schwarzkopf, Edmontonʼs Electric Transit, Railfare, Toronto, ON, 1983. Monto, Tom, Old Strathcona Before the Great Depression with Métis Strathcona by Randy Lawrence, Crang Publishing, Edmonton, AB, 2008. Mundy Maps of the City of Edmonton, 1912 and 1913. Hatcher and Schwarzkopf op.cit., p. 84. 6 Hatcher and Schwarzkopf op. cit., p. 109. --, Naming Edmonton, From Ada to Zoie, The City of Edmonton, 2004. Hatcher, Colin K., The Bonnie Doon Streetcar Line, The Trip Sheet, Volume 22, Number 2, April 2012, Edmonton Radial Railway Society, Edmonton, AB.